I was delighted to find your site after some searching on the web this evening and saw your kind offer to respond to questions about bottom marks. I learned from the site that "red seal" marks are on certain pieces from China and something we picked up at a thrift shop today has such a mark. I am enclosing the mark and a jpeg of the porcelain dog figurine/candle holder and wonder if you have any idea of its vintage. 1. I am most disturbed about the black lines--his neck line and the outlines around the "saddle" and side panels. They are irregular in thickness--and seem very "primitive" or hastily done (which?). 2. The "medallion" around his neck has a modern feel to it, something I can't put my finger on but it seems to trivialize the piece. 3. In the inkwell there are scratch/wear marks in the design pattern exactly where one would expect to see them if they were using this as an ink well and sticking pen nibs in and out on a regular basis (as a right-handed person). 4. There is paint wear on the toes, nose, tail and raised curly "hair" (which is on the back of the head). 5. The inkwell shows irregularities in the porcelain that suggest it was hand made--it is not perfectly round, not entirely symmetric. 6. Someone did use this for a candle as there is a small amount of wax in the bottom of the well. 7. The floral pattern as drawn in black is a bit raised--you can feel the detail by moving your finger over all of it; the color is distributed in such a way as to seem hand done. 8. The gold is very gold--my digital camera does not show gold well for some reason--and outlines the nose, mouth, eyes, etc. and is the background for the floral designs. 9. The eyes and other details are not flat--the pupils and irises are raised and three dimensional. He has two relatively deep nostril holes. 10. The red seal mark is under his front left (in the background in the photo) paw. 11. Another thing that concerns me is what I wonder may have been an attempt to age the piece--there was some kind of gold paint on the bottom and inside that is water soluble because when we washed the bottom to clean up some soiled areas this goldlooking stuff washed off. On the other hand, the porcelain on the bottom does show some irregularities like the surface crack that runs through the red seal and causes the problem in the lower left character. 12. By the way, the dog measures 7" tall and is about 8" long. He has a "happier" look than appears in the photo--I guess it is the angle of the image that changes his expression a bit. Apologies for being long-winded, but I assume that the more information you have the better and I've been thinking about and looking at this myself because of the mixed messages it seems to give! Thank you for sending me a picture of you new "pet". 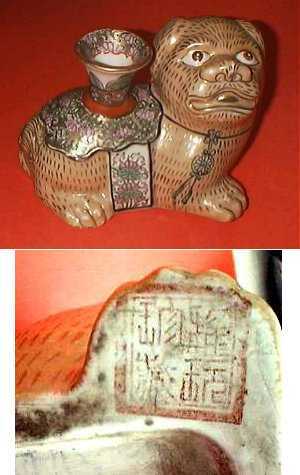 This type of dog figures are almost always described by the trade as a "candle holder", probably because it looks like one, and probably because a possibly "use" might make it easier to sell. Now, the original use was more likely a brush water pot for the desk of a Chinese Scholar. Shaped as a Buddhist "Fo" lion, or "dog of happiness" it would also have been an appropriate thing to have on ones desk, to remind you of the Buddhist rules of good conduct. Regarding your figure, I am somewhat uncertain of it age, since its intended use as well as general design, really indicates a 19th century date. Still, some features make me think of a later date. The mark gives us no more information. It is a collector's or factory mark, and reads Ya Wan Zhen Chuang (Delicate Collectable Precious Treasure) which does not helps us much for the time being. Your observation about the gilt is a key, though, since antique Chinese gilt are of a very special shade and have been very similar up until the 1950s when a much more glossy and metallic looking gilt came into use, after what it looks like right now, first in Macao, then soon thereafter in Canton and Hong Kong. Then again on modern pieces - I would say during the last decades of the 20th century - a more muddled "full" gilt came into use. It really looks more like paint than gold. This is about as far as I dare to go on this piece. It would have been interesting to have handled your "Fo dog", since that might have settled something we have been wondering about for some time, but for the time being I would suggest mid 20th century or later as a probably date - keeping a very open mind for corrections. The translation of the mark courtesy of Mr. Simon Ng, City University of Hong Kong.